Dewsbury Town Centre is the subject of a bid to improve the look of its facilities. The multi-million pound regeneration of Dewsbury town centre could see a further three-quarters of a million spent on a ‘spring clean’ of its facilities. 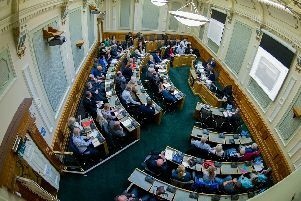 Kirklees councillors have been asked to support the investment to fund the first year of a Better Spaces programme as part of its ‘Strategic Development Framework for the town’. Councillor Peter McBride has spoken up for Dewsbury's potential. The proposal is a continuation of a vision that would position Dewsbury as an area of housing and employment growth within the Leeds City Region. The ‘Spring Clean’ would spruce up the heart of Dewsbury with works including painting, improved lighting, better street furniture, green infrastructure, and cleansing. Roads and footpaths would also be tackled during Spring and Summer of this year. Quarter already up and running, and the next stage at the Pioneer House building due to be handed over to Kirklees College so they can fit it out due in early Spring, our commitment to Dewsbury continues. “We are also excited about the Station Gateway scheme, all of which adds to help celebrate the significance of Dewsbury’s historic significance as a regional economic centre. Over the next six months, the town centre will see other things happening including the opening of the refurbished Black Bull public house, the refurbishment of the old Baileys Café and improving empty shop fronts. The Cabinet will be asked to approve a funding of over half a million pounds - from the £45 million the council has allocated to the town centres budget - to fund the package of £765,000 of year one improvements.